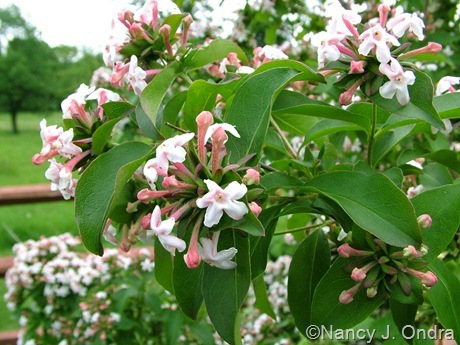 You may already be familiar with its better-known cousin, glossy abelia (A. x grandiflora): a multi-stemmed, semi-evergreen or deciduous shrub with small, pink-to-white flowers that appear through much of the growing season. Glossy abelia isn’t a “wow” plant, because the blooms are small and scattered along the stems, but its long bloom period, light scent, and purplish fall color do garner it some fans among those looking for multi-season shrubs. 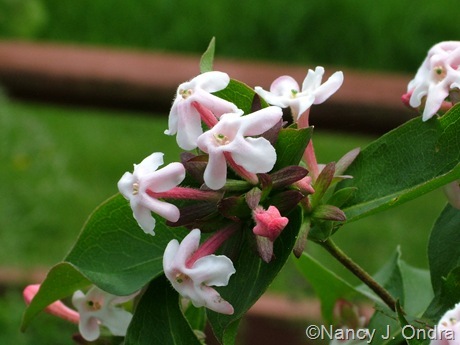 Hardy abelia has a much shorter flowering period – usually about three weeks in May here in southeastern Pennsylvania – but it’s much more noticeable, loaded with clusters of rosy pink buds opening to pinkish white blooms. You don’t need to see it to know when it starts flowering, however, because the rich scent carries for quite a distance. (I’ve noticed it from a good 30 feet away.) The exact scent is hard to describe: not sweet or fruity, but pleasingly perfumey: something like a lilac, if I remember correctly, or perhaps a daphne. Hardy abelia blooms at the same time as many spring classics, including purple alliums, bearded irises, bluestars (Amsonia), columbines (Aquilegia), hardy geraniums, and hybrid tulips, so there are lots of opportunities for creating combinations that are a treat to smell as well as to see. To be fair, hardy abelia isn’t much to look at once it’s done flowering: the habit is kind of rangy, and the foliage is not distinctive, though a nice deep green and seemingly not much bothered by pests, diseases, or drought stress. 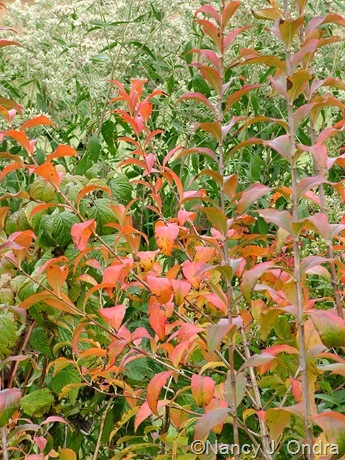 In fall, it offers another great show, in the form of glowing orangey red fall color before the leaves drop. 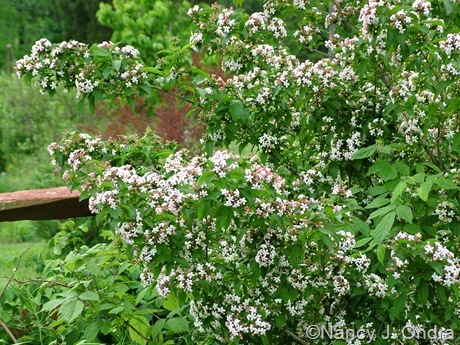 Hardy abelia reaches about 6 feet tall and wide. I occasionally remove one or two stems at the base right after flowering to keep it from blocking a path but otherwise leave it alone. (Trying to keep it smaller by cutting the stems back partway makes the whole plant look really ugly.) 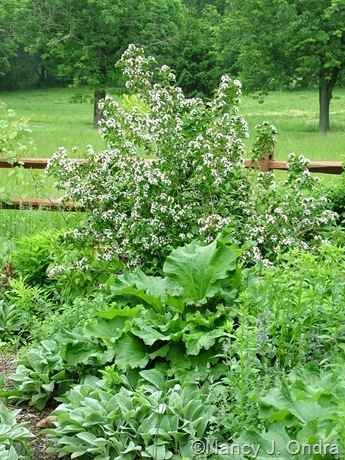 Granted, that’s a fair bit of garden space to give a once-blooming shrub, but in that respect, it’s not all that much different than a lilac or forsythia, with the added advantage of the splendid fall color. Hardy abelia is reportedly hardy in Zones 4 to 9 and is available from a number of mail-order sources, including Bluestone Perennials and Dancing Oaks Nursery. If hardy abelia is charming and cottage-gardeny, the next two neat plants are the exact opposite: off-putting and edgy, in an anti-social sort of way. Still, they’re intriguing and worth a bit of bother, if you have a taste for the unusual. Solanum atropurpureum, commonly known as purple devil or malevolence, looks rather like a nasty weed from more than a few feet away. Up close, it looks even nastier. 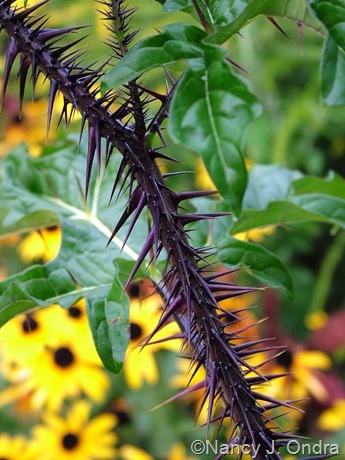 …but for its stunningly spined, deep purple stems. 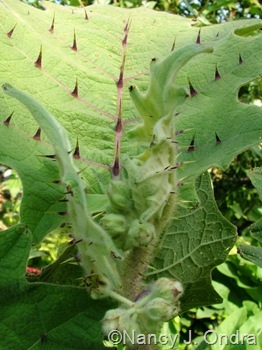 Purple devil reaches 3 to 4 feet tall, first growing straight up and then branching toward the tips. The spines are evident when the seedlings are just a few inches high, but fortunately, they’re still soft enough then that it’s not too unpleasant to move the plants to individual pots. I set them out into the garden when there’s no chance of frost. By that time, the spines are getting harder, so wearing gloves is a good idea. And at cleanup time, I recommend heavy leather gloves and long-handled loppers. 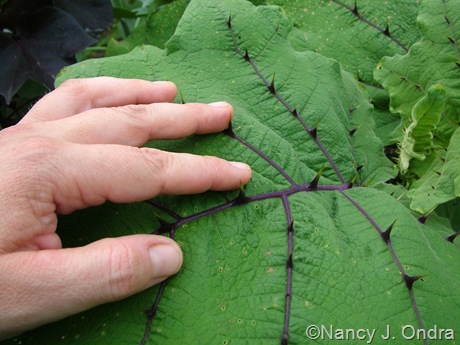 In between, you won’t have much reason to touch the plants, but it’s irresistibly tempting to try at least once. 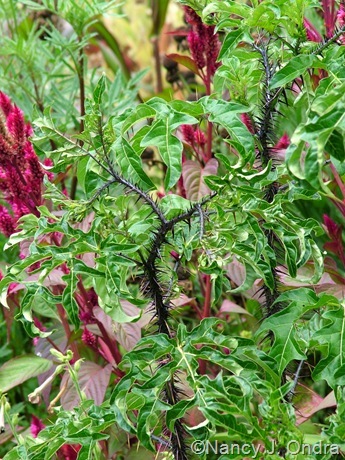 Seeds of purple devil are available from Plant World Seeds. 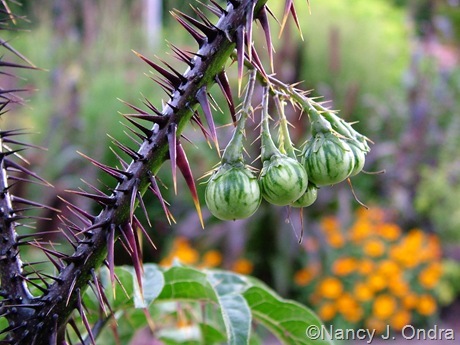 Another option for an impressive spinal display is Solanum quitoense: naranjilla or bed-of-nails. 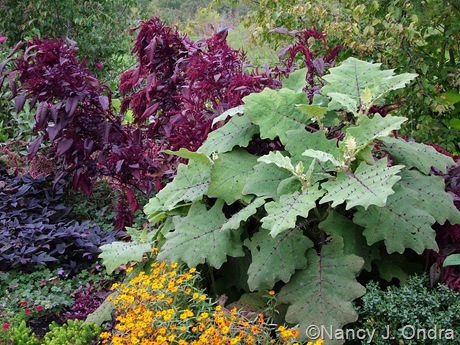 Its spines aren’t as dense as those of purple devil, but they’re displayed on big, broad leaves that make quite a statement in a border or container. 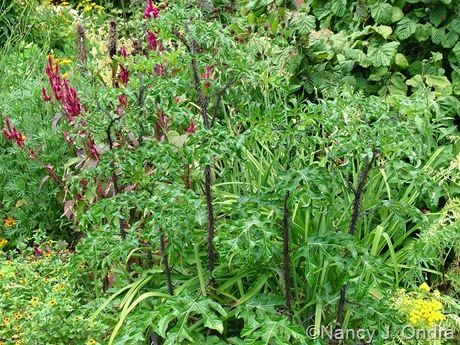 The 3- to 4-foot-tall stems are spiny too, but it’s hard to see them because of the dense foliage. The flowers are also mostly hidden, but they’re not showy anyway. They’re followed by fuzzy fruits that are said to be very tasty, but so far, I’ve never had the fruit ripen here. 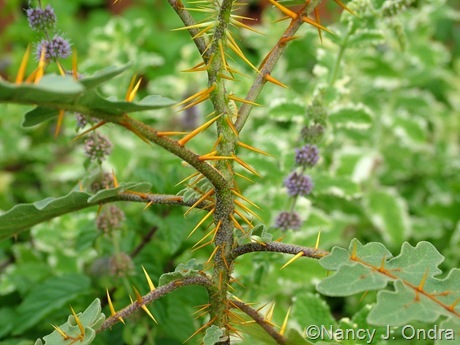 As with purple devil, the seedlings are spiny even when young, and you want to get them in their final spots as quickly as possible so you don’t have to be working around those spines when the leaves get big. 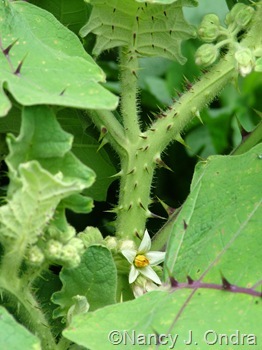 There are apparently two versions of naranjilla: one with spines (sometimes listed as S. quitoense var. septentrionale) and one without (S. quitoense var. quitoense). The seeds I’ve gotten in the past from the Hardy Plant Society/Mid-Atlantic Group’s Seed Exchange have always produced the spiny kind shown here. 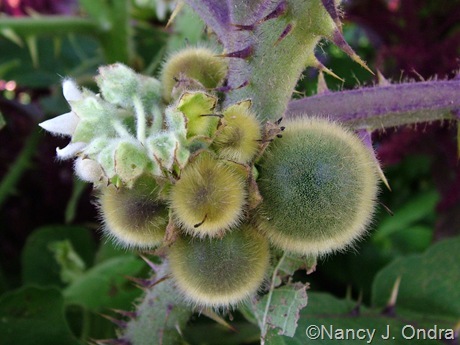 One online source of seed for the spiny naranjilla is The Banana Tree. Trade Winds Fruit doesn’t mention spines in their description of the seeds, so I imagine they sell the spineless kind. Annie’s Annuals and Logee’s show the spineless one on their sites, but plants are currently not available from either source. 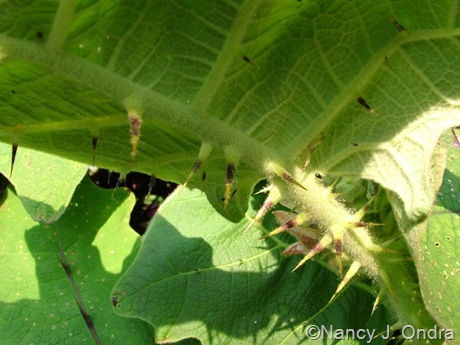 I can see that spineless naranjilla would be very appealing as a foliage accent, though you lose the quirkiness value without those splendid spikes. 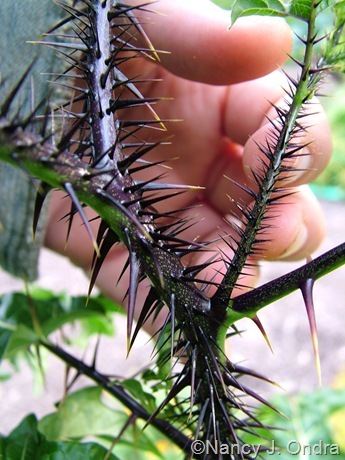 For even more spiny goodness, consider Solanum pyracanthum too. I covered it in an earlier Neat Plants post, which you can find here. May I suggest a new title for this post “A Shrub and Two Scary Plants”. The spines look intimidating! I’d like to be able to threaten the rabbits with those two plants. Brilliant, Marie! That’s certainly a more creative choice. 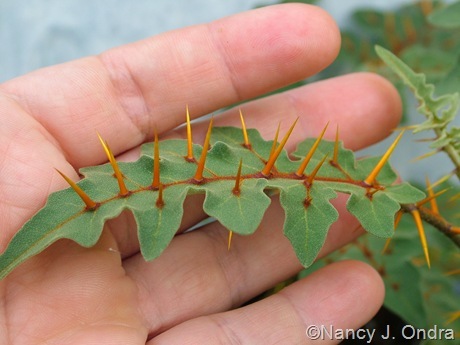 And I will say that I’ve never had rabbit (or deer) damage on the spiny solanums (or on the abelia, for that matter). Great selections. 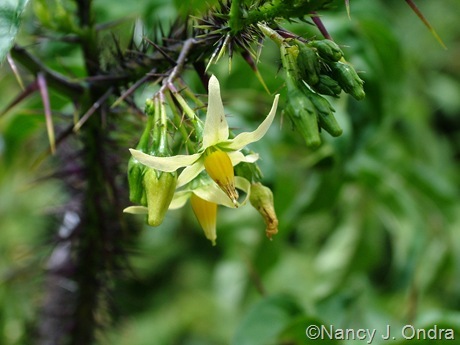 Last year, I ventured into the strange and wonderful world of Solanum’s. 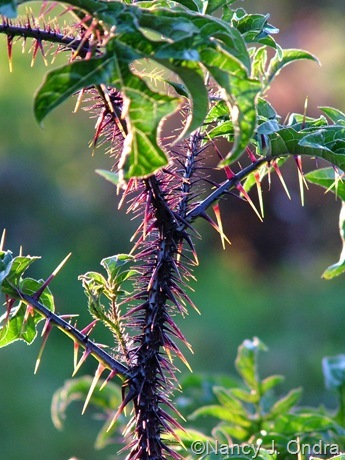 I have a thing for mean looking plants, and the Solanum atropurpureum you featured might be the coolest mean plant I’ve ever seen. I always learn something new at your site. You have a gift for spotting under appreciated plants. Thanks, Thomas. 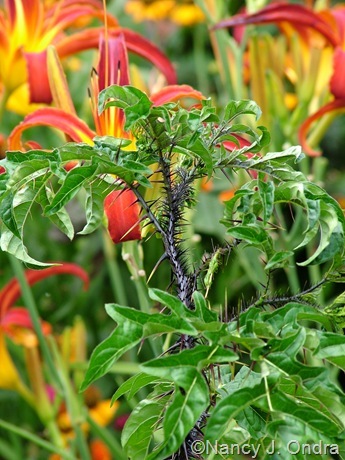 The quitoense and pyracanthum spines are equally as sharp, but they can’t beat atropurpureum for sheer density. Malevolence, indeed. Ouch! Just looking at the pictures of the Purple Devil makes me cringe. I think I’ll avoid planting those in my garden – to dangerous for the kids. ‘Tiger Cub’ and the Cotton are doing great by the way. The rice has nearly succumbed to the heat. I haven’t been able to water as much as needed this year. No, definitely not good choices for small, delicate fingers, Dave. I’m sure they’ll enjoy helping you clean the cotton seeds, though. It’s been so hot here that I may even get to harvest seeds here again this year. That photo… [labeled as #059.jpg] is the SOLE REASON behind my now want – no, NEED – for this plant. Stunning! And I love the idea behind having a plant that’s a great conversation starter… I can see that planted just in front of a softer yellow-green shrub and a ground cover of orange/variagated nasturtium… auuuugh! Want, want, WANT! I will also have to get my hands on that Abelia as well. I don’t care that it has a short blooming time – maybe the scent is strong enough that while I have allergies I’ll still be able to smell it! Hehe. Definitely, I can see the purple devil leading to some very interesting conversations, Donna. And yes, the abelia’s scent is very strong, though not unpleasantly so. It blooms just a bit before mock orange and is just as good for scent, with the added advantage of the great fall color. Ohhh! I’ve had Solanum quitoense in the past for my Harry Potter Garden (used to be my daughter’s garden but now she couldn’t care less, I’m told 13 does that to a girl). 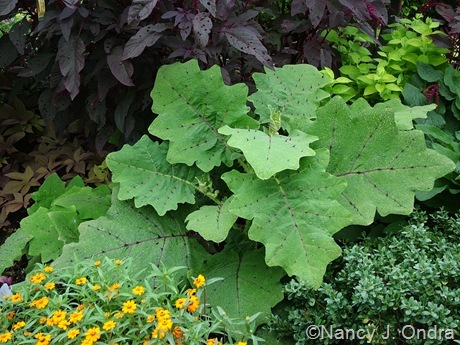 I see Purple Devil and Solanum pyracanthum in the Harry Potter Garden’s future! The big advantage these two is that they take up a lot less real estate than the quitoense. For me, pyracanthum gets maybe 1 foot tall and wide by frost, and the atropurpureum is about 3 feet tall and 1 foot wide, compared to 3 x 3 for the quitoense. I’m glad that you’ll be continuing the HP garden, Jim. I’m sure you’ll be able to come up with some fun Potterverse names for the new additions. the dark side of green. Heh – and purple and orange, too. Ummm, I think I’ll pass on those wicked, spiny things. I’m perfectly capable of inflicting injury on myself in the garden without them. The Abelia, on the other hand, looks like a great plant. Fragrance on the breeze is a strong pull for me, and the short bloom time is balanced by the good fall color. A way to dress up that Abelia during the summer would be to grow one of the shorter, smaller flowered Clematis on it. They’re not for everyone, that’s for sure. Good suggestion about the clematis on the abelia, though I’ve had mixed results with the clematis-on-a-shrub route: in many cases, it just looks messy to me. I LOVE this site. You are a master (mistress would be more apt) with the camera. Your writing is interesting and informative, and above all jolly inspiring! Every new post is a real treat for me… I wait ’til the kids are having a sleep, make a hot cuppa, and sit down for some uninterupted reading. Thank you! What a lovely thing to say, Kerry. I’m delighted to have you as a reader! Great post, Nan! 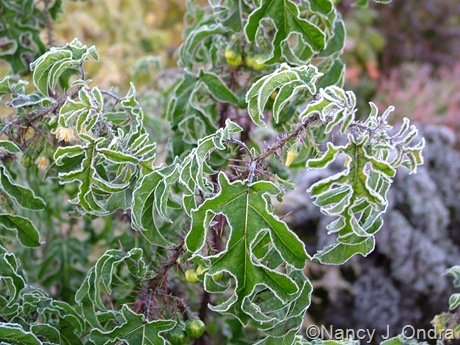 I especially love Solanum quitoense and have been meaning to grow it. My first exposure to it was when I lived in Quito, Ecuador. The fruit makes a tasty–if odd colored–green drink. They would smash the fruit and add lots of sugar. Hey – I’d forgotten that you were there; how cool that you actually tried the drink! I can imagine that harvesting the fruits would be much easier from the spineless variety. Yes, scary indeed although the first one is just darn pretty.